When a starting pitcher tops 99 miles per hour on a pitch, people tend to take notice. When that pitcher does it five times to end his outing after more than 115 pitches prior, well, people really take notice. Justin Verlander added another notch to his fantastic season yesterday when he held the Boston Red Sox scoreless in eight innings at Fenway, helping the Tigers avoid a four-game sweep. That seems to lend credence to the numbers, but if you assume the pitchfx machine recorded speeds 0.3 MPH faster than reality, then Verlander’s 100.1 reading loses some grander and becomes 99.8 MPH – typical batting practice speed – a less round, but just as impressive figure. Verlander’s fastball was simply ethereal yesterday no matter how fast it went. 14 of 85 fastballs generated swings and misses. That’s 16.5% and simply ludicrous. When nearly one-fifth of the fastballs you throw result in the batter whiffing, then just might have a pretty special pitch at your disposal. Unsurprisingly, our pitch value numbers back the suggestion. 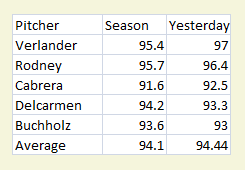 Heading into yesterday’s start Verlander’s fastball was worth nearly two wins at 17.4 runs and that figure should increase after turning Fenway into his personal slaughterhouse. We hoped you liked reading Justin Verlander’s Wicked Fastball by R.J. Anderson! And to think we might not have even signed him unless his dad contacted the Tigers directly after the team broke off talks with his original agent. Thank god for union men!